In today's tech-centric world, cyber security gets a lot more attention than real-world security. This makes sense as new cyber threats seem to pop up every day. For new businesses especially, there is a need to focus on securing sensitive data online. 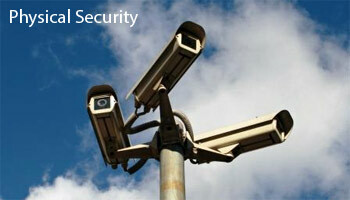 But overlooking physical security can be very costly. In simple terms: Physical security helps businesses protect property and people. Property can mean buildings, equipment, data, or intellectual property. People refer to employees, customers, or anyone else on company premises. It's about real-world threats, human or natural . Then, put systems in place to minimize risks. Still, there is plenty to do before you even get to that point. Make sure the neighborhood learns about your brand fast. Few business owners take the time to make connections with the community they are in. A network of friendly eyeballs can be one of the strongest security systems around, even for businesses that don't directly serve the community where they are located. Put up Business Under New Management signs and run a strong marketing campaign. Go out and shake hands; meet your neighbors and talk to them about the area. Experienced entrepreneurs already do this when selecting a location because it's important to know crime rate and risk of natural disaster. Are you in a "bad neighborhood"? The answer will help you figure out how strongly you'll need to Lock Things Down. Is our current lighting adequate to keep employees and customers safe? Do any of our windows and/or doors need upgrades against force? Do we need an alarm system, security cameras, or a guard patrol? Where should we place our sensitive hardware? Do we need to take any extra precautions against potential fire or water damage? It's important to have both safe facilities and safe policies. So an effective security plan must be comprehensive and integrated, accounting for all sorts of threats. Take the surrounding environment and nature into account. But focus on access control and responding to intruders. Fire. Hale. Earthquake. Floods. All scary. But human beings are the greatest security threat there is. The best course of action is to completely restrict outside access to very sensitive areas and to plan in terms of the worst-case scenario. However, planning against outside threats is only one piece of the puzzle. Inside threats often have even more potential to do damage. For most businesses, employees are hands-down the greatest security risk. Some of it has to do with malicious intent. Some of it has to do with bad luck. But the majority of it has to do with poor training and systems. Regardless, this reality brings a few things into sharp prominence for businesses today. 2. You need the right systems. 3. You need the right training. Smart entrepreneurs look at the hiring process like a filter. It's your first line of defense against individuals that might do your company harm. Use as many resources as you can to uncover potential cancers before your bring them into your business. Remember, the people that work for you are the ones that can most easily walk off with your business's property or clients' sensitive data. It is true that you want to secure your property for the sake of your personnel, but you also want to secure your personnel for the sake of your property. Go with a stringent hiring process. This is the best way to find managers and other key personnel who are competent and trustworthy. Your people are the foundation for secure systems of operation. New business owners have many considerations when it comes to how their business is going to function on a day to day basis. For many businesses, restricting access to sensitive data or valuable hardware inside the company is just as important as protecting it against intruders. Installation of new locks, a locked door, and access control systems can go a long way to deterring employee theft. Think cash management, door opening & closing procedures, and disposal of sensitive paperwork or hardware. Every business owner has to make the tough decisions for themselves. It won't matter what systems you decide on if the people you hire don't know how to put them into place. Your great hires can only put your great security policy into practice if they know how. Training is the glue that binds your personnel with your security management plans. Any savvy manager knows how important training is to individual and team productivity. Ideally, training is in-depth and ongoing. Security should be a stated point of emphasis. Also, training should be person to person, from higher rank to lower. Because: People adjust. Manuals collect dust. With evolving threats, training manuals become outdated very quickly. However, ongoing conversations about business security keeps it on the minds of those that work for you. In every aspect of business, it's important to stay on the cutting edge. Physical security is no different. It might sound like an old-fashioned topic. But this industry is still evolving to keep up with new threats. Ignore on-site security at your business's own peril. Far too many new businesses don't pay enough attention to security policy until it is already too late. Instead, do the research, put your systems into place, and adapt as needed. UPS Postoffice Locations, maps and Postoffice Opening Hours in all USA states.